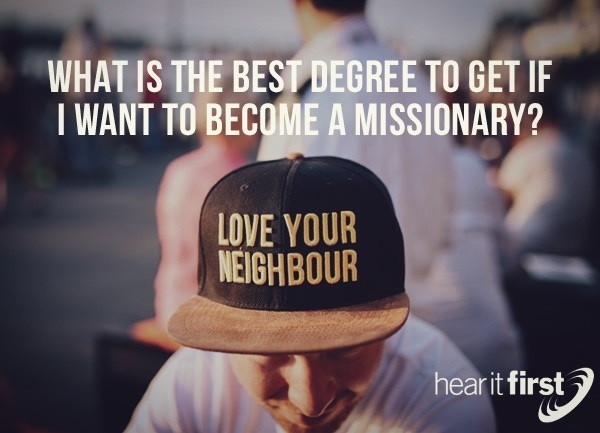 What is the best college degree to have if you want to become a missionary? Perhaps the most famous of all missionaries in human history (next to Jesus Christ) was the Apostle Paul, and Paul was more than qualified by his educational background, because he had studied the law of God and knew that the law shows us what sin is (Rom 7:7; 1st John 3:4). He sat under the teaching of Gamaliel who was the head of the legal-religious body in the three epistles and who the apostle Paul himself sat at the feet of Gamaliel (Acts 5:34-39; 22:3) but Paul was also instructed by the Lord Himself as he wrote, “I did not receive it from any man, nor was I taught it, but I received it through a revelation of Jesus Christ. For you have heard of my former life in Judaism, how I persecuted the church of God violently and tried to destroy it. And I was advancing in Judaism beyond many of my own age among my people, so extremely zealous was I for the traditions of my fathers” (Gal 1:12-14), saying God was “pleased to reveal his Son to me, in order that I might preach him among the Gentiles, I did not immediately consult with anyone” (Gal 1:16), so we can’t say Paul didn’t have an education. He was taught by the best in the Roman world at the time, and then learned directly from Jesus Christ and didn’t consult with anybody else about it, so Paul was trained in a scholarly manner, but also had better than the best seminary professors by being taught by Jesus Christ. No one qualifies themselves to be a missionary. They might receive the proper education to be one, but of course like Paul, it is ultimately because of God’s calling and not ours, so God doesn’t wait until someone is qualified to be a missionary, but rather, God qualifies the missionary to proclaim His Word to those who are lost. No amount of education can replace the call of God on a person’s life, so that must come first, or perhaps come from a church calling a man or woman to be a missionary for the kingdom of God, however the missionary should already have a passion and deep desire to seek those who are lost because this will compel them to be more bold in proclaiming the gospel than someone who does not have a broken heart for those who are without Christ. Certainly, we should all have a compassion, love, and care for everyone who still has God’s wrath abiding on them at the present time (John 3:36b). If you don’t care about the lost, then don’t care to become a missionary, because this is why a person becomes a missionary in the first place. Missionaries take the imperative command from our Commanding General, Jesus Christ, to go into all the world very seriously (Matt 28:19-20). They understand Jesus’ direct order to make disciples of all nations and to teach them the same things that Jesus taught His disciples, and since those teaching are found in the Bible, a degree in some Bible program or discipline is very important. A missionary must know the gospel so well that he or she can present it well, but how will they know the gospel unless someone tells them? And how will they hear the good news unless someone is sent? Is that you? If you think it is God’s calling for your life, here is some college or university degrees that can help you fulfill your mission for God. A great foundation for any education in my opinion is a Bible studies degree. Often this is either a minor or an associate’s degree, but it can be a full bachelor’s degree as well. It just depends on the students overall focus. There is never any harm in building a degree on Bible studies or having a Bible degree in the New or Old Testament. These studies can focus on different areas like in the law, the patriarchs, apologetics, and surveys of the New Testament, or in-depth programs that zero in on the gospels. Whatever you decide, and after seeking godly counsel from a church leader and an academic advisor, you will never regret having a Bible studies degree, whether it’s a master in biblical studies (MABS) or an associate’s degree, just make sure you at least take this with you into all the world, even if it’s next door. Every person who loves the Bible would benefit from a theological degree. This is a degree that can include a second or third language. I learned Spanish so that I could share the gospel with others in their own language, and so the Spanish courses I took served me well in sharing the gospel with those who speak Spanish. A theological degree might focus on the New Testament studies or in the Wisdom Literature, but there are focuses on missions, ministry, worship, music, teaching, leadership, and a host of others studies. History is a great degree for those who are studying to be a missionary because missionaries need to know what to expect in other parts of the world. What might seem to be acceptable here in the states could be very offensive to someone in another nation. The more we learn about a certain culture, the better we’ll be able to share the gospel with them in ways that they can understand it. Just like a degree in social sciences, history is society-focused and allows us to learn how certain nations have become the ways they are today and why. It can help us avoid causing unnecessary offense to people of another nation. Knowledge is power, at least in the sense of having the ability to transfer an unknown message (the gospel) to a culture that is relatively unknown or difficult to penetrate. Some missionaries become missionaries for life, while others do missionary work for a time and then take a break, perhaps to return at a later time, but the fact is we are all on mission from God to seek out those who are lost, and to share the good news with them. It’s not our responsibility to save anyone but rather, it is their response to His ability, even though God will use us as a means, so any Bible education we have will allow us to be better equipped when we or someone you know goes into other parts of the world. The Apostle Paul reminds all of us that we need witnesses, otherwise, “How then will they call on him in whom they have not believed? And how are they to believe in him of whom they have never heard? And how are they to hear without someone preaching” (Rom 10:14)?